Neck Dissection is an operation designed to remove groups of neck lymph nodes for treatment of cancer that has spread from a primary site elsewhere in the head and neck region. Primary tumours in various individual sites tend to spread to different nodal levels often in a predictable manor. For example skin tumours from the lip and anterior face tend to spread to Level I and Level II and/or other levels subsequently, while melanomas on the posterior scalp tend to spread to nodes at levels 2-5, and thyroid cancers tend to most commonly involve nodes at levels 4 and 6. Outcome is affected by the number, size, and position of lymph nodes involved. Cancer also has the ability to grow beyond the confines of the lymph node capsule into surrounding tissues: this is known as extranodal spread (ENS) or extra-capsular spread (ECS) and it is a bad prognostic factor. Usually the larger the node the higher the chance of extra-nodal extension. During the 1980's it became apparent that recurrence rates were no different between selective dissections and more radical procedures but the morbidity of the “ selective” procedures was shown to be less. In addition, data are now available indicating likely levels of nodal involvement for individual cancer sites e.g., lip spreading to Level 1,2 &3, posterior scalp melanoma spreading to levels 2-5, while the most common sites for facial and anterior scalp melanoma to spread to are nodes in the parotid salivary gland and level 2 -4. Selective Neck Dissectionis the emerging as the procedure of choice for treating occult or early clinical neck metastases. The incision is dependent upon which nodes are to be resected. For Levels 1-4, a ‘ hockey stick’ incision is usually made from the mastoid muscle extending down the neck and anteriorly. 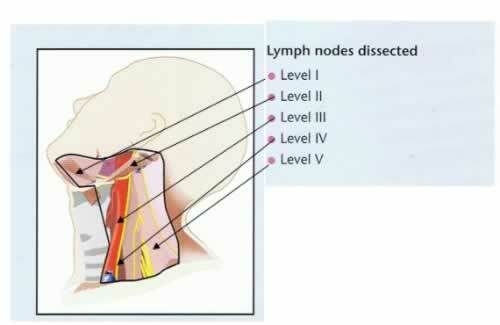 If parotid nodes also require dissection, this can be included as shown in Fig 1 below. For dissection of Levels 2-5, for example in the treatment of a posterior scalp melanoma with regional disease, an incision similar to Fig 2 below is required. The incision is deepened to form flaps, important nerves are avoided and relevant nodes resected. Usually the internal jugular vein and sternomastoid muscle and the eleventh cranial nerve can be preserved but if they are involved by the cancer they also require resection. A drain is briefly required and hospital stay is usually 2-3 days. Seroma (fluid collection deep to skin flaps). NB: Although all of the above may occur, major and/or prolonged complications are unusual. Outcome is usually satisfactory and survival following such surgery is mainly dependent on the extent of the cancer at the time of treatment.